We had some guests, friends from Vancouver who now live in Munich, come to stay with us this past weekend. Our espresso machine was put to good use. Our sofabed was put to good use. Our cats found that the audience for their plaintive yowls for food and attention was suddenly doubled. We ate a lot of cheese. It was a good weekend. It was also, I think, the first time that I’ve ever managed to get a sunburn in April. 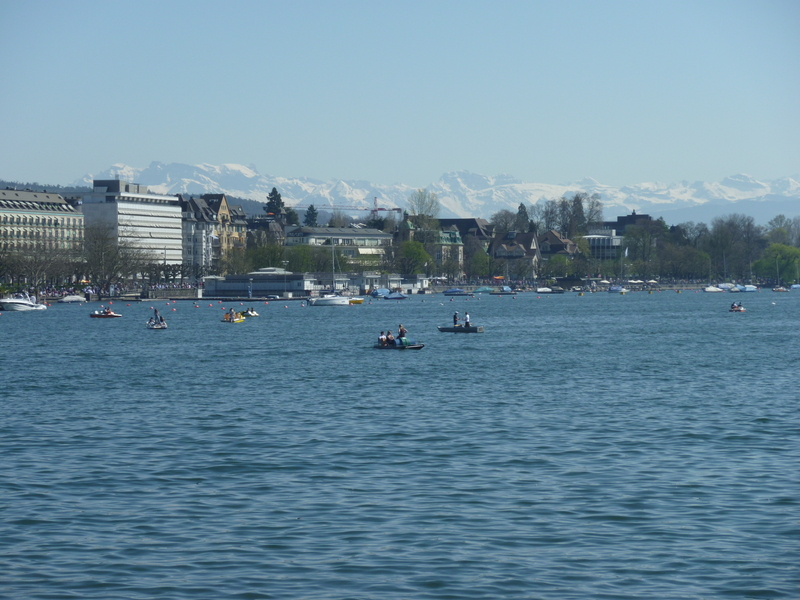 I was not quite prepared for the temperature to be in the mid-twenties and for us to be wearing t-shirts as we paddled a boat across the Zürichsee on Saturday. I was lobster-coloured in certain places after that afternoon. It may have been the reflection off the water that made things worse. Here’s a picture that I took from our paddleboat. It’s not the best quality, I realize. But the thing to notice is that you can see the mountains — the mountains were “out.” It doesn’t happen all the time, and this is the first time that I’ve managed to capture it on film. I actually overheard a tour guide say to a group on this weekend: “over here is a viewpoint where you can see the city of Zürich…and today, you will see the mountains as well.” The mountains are a special show that not everyone witnesses. We likely annoyed our guests by pointing this out repeatedly. After our paddleboat adventure, we went to Sprüngli, the famous Zürich chocolate shop, where a staff member attractively packaged a box of Luxemburgerli for us, perhaps thinking that we were buying them as a gift. Then we exited the store, tore open the box on the sidewalk right out front, and devoured the little delicacies in about eight seconds. Then we went for dinner. And later, we had ice cream. Paddleboating is serious exercise. I won’t let you tell me otherwise. 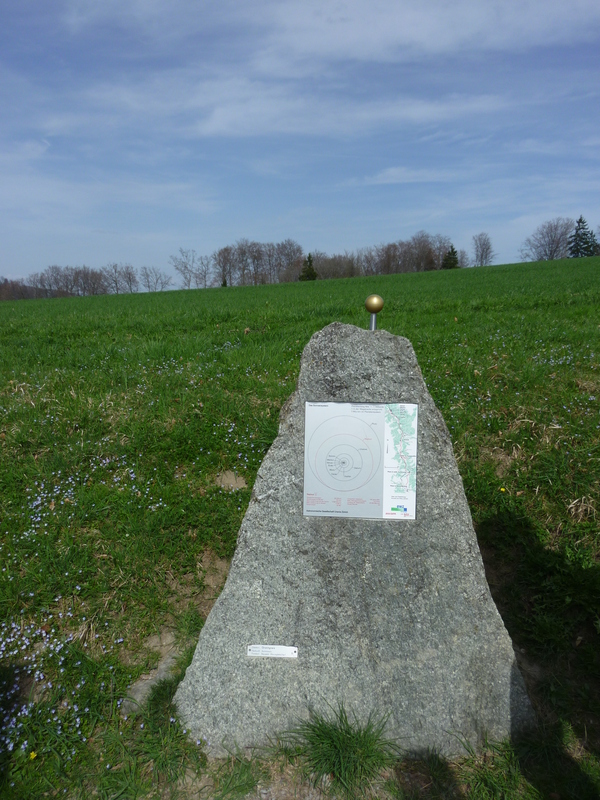 Stelian and I had thought that we might venture out of Zürich to do a hike on Sunday, but our guests had come with a preconceived mission: they wanted to hike the planetary trail. So we set off to the top of the Uetliberg, one of the mountains flanking the city. Really, it should be the end of the walk, but Pluto is still considered a planet according to this trail. Too bad; no opportunity to use the “when I was your age, Pluto was a planet” line on little Swiss kids. Not that they would have understood, anyway. The Planetweg also offered an unfamiliar (to us) planet: something called Ceres, which fell between Mars and Jupiter. We stood puzzled at its sign with some French tourists, all of us shaking our heads at this apparition that didn’t fit into our MVEMJSUNP acronym and attendant mnemonics. Later googling revealed that this is a dwarf planet, like Pluto. Well, fair enough. But even if the Swiss do think you’re worthy of the Planetweg, my pancake story ain’t changing for the likes of you, Ceres. Except without Pluto, which is gone now…oh, darn it, it’s already all messed up. Once we made it to Pancakes — I mean, Pluto — we realized that we were stranded, because we didn’t have enough cash to take the gondola down the mountain (don’t be like us: always carry lots of cash when in Switzerland). So, it was either trek all the way back to the Sun (which, incidentally, would have had us facing the sun), or climb down the mountain via a path through dense forest. I happily took the shaded option — the sun and I needed a little break from each other. Categories: Food, Zürich | Permalink. That is the coolest hike ever!! I bet there’s a perennial pilgrimage of – how should I put it – those astronomically inclined. There’s a clue about why Ceres isn’t really a planet, it’s the fact that its between Mars (whose orbit defines the exterior of the interior planets) and Jupiter (whose orbit defines the interior of the exterior planets :P). Ceres is actually a surviving proto-planet in the asteroid belt, where the diameter of the body was large enough to create a foreceful gravitational field and actually ended up producing a spherical object. Because of this, it looks like a planet, but is really somewhere between planet and asteroid; hence the “dwarf” classification, as those politically correct chagrin! The mountains look nice. lol 🙂 Too bad they’re so coy though! Whoa — I’m not sure I understood that, but it sounded impressive. This kind of stuff is over my head (excuse the bad pun). It’s cool that you know/study these things! Stelian says that I have looked through your telescope before (even in Elora last year), but I don’t really recall. Uh, yeah. Like Patrick said. My Very Educated Mother Just Served Us Nine Pancakes! Now, of course, it’s been downgraded to …Served Us Nuts. Or so the internet says.